You know how the ladies love their handbags and shoes to bits and can never get enough of them? Well, guys have their interest in some form of bling as well, and more often than not they come in the guise of watches. Yes sir, those expensive timepieces that you have always peered through the showcase glass when you were a kid, wondering to yourself just how the heck does one have to do in life in order to purchase one? After all, names such as Rolex and Patek do not come cheap, numbering in the tens of thousands for a high end model. Well, how about a substitute that shows the world you are sophisticated and yet simple enough to not base your self-worth on a timepiece? This is where the Cadence 4-Bit Steel Watch comes in, as a new addition to their line of 4-Bit Watches, otherwise known as the 4-Bit Steel. Similar to the rest of its predecessors, this new model will rely on 4-bit binary code when its comes to telling the time. Geeks will definitely love the secretive way in which the time is displayed, and the rest of the world will have to do their part to figure it out. To know how to tell the current time, look carefully at the watch. There will be a quartet of boxes that represent the numbers 8, 4, 2, and 1. The key lies in these figures, where the least significant bit will always be on the outside of the dial. For example, 8 will always be the box closest to the hands with 4 being second, 2 third and 1 closest to the outside. Hopefully that ought to be sufficient enough an explanation to get you started, no? 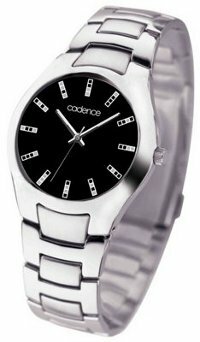 Nice to know this Cadence 4-Bit Steel Watch is water resistant up to 5ATM, making it ideal for everyday use without worrying about it rusting many years from now, or stopping completely. With a sapphire coated quartz glass, the face of the watch will have a hard time getting scratched. How much for this fashionable timepiece? We are looking at $115 a pop when it arrives later this August.